When it comes to building an audience that builds your freelance or consulting business, email remains the undisputed heavyweight champion. Email was the original “killer app” — everyone uses it, and that’s why it’s been the absolute best channel for digital marketing and audience building. And yes, that’s still true in 2018. The stats don’t lie. Every $1 spent on email marketing produces $44 in return, probably because 58% of adults wake up and immediately check their email (mostly on smartphones). And email remains 40 times better at converting people than Facebook and Twitter. 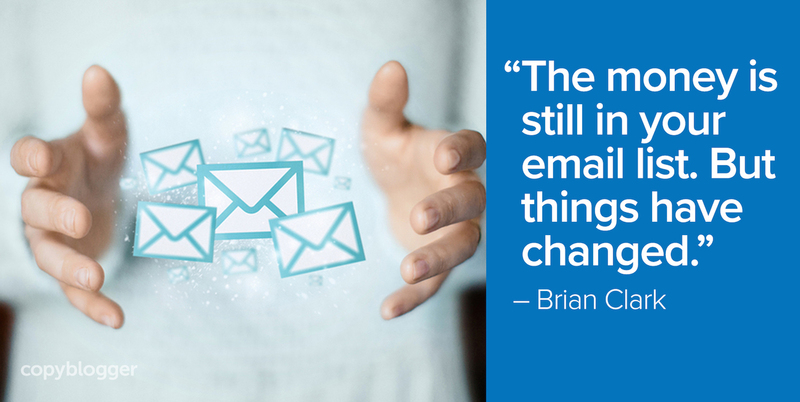 But that doesn’t mean that email marketing is the same as it’s ever been in years past. In fact, this is the one area where technology gives strategic content marketers an undeniable edge. In other words, the money is still in your email list. But things have changed. The days of publishing massive amounts of content, hoping for some of it to go “viral,” and counting on converting that massive traffic to your email list are over. And when was that ever sustainable for people who have to spend most of their time and creativity on serving their clients? Talk about a path to burnout! Nowadays, the idea is to create the most on-point experience possible for your ideal prospect. It’s not how much content you deliver, it’s how impactfully you position yourself as the perfect choice for that particular person. So how do you do that, exactly? What’s the strategic process that allows you to smartly use email marketing to turn more leads into more clients? We’ll be doing a free online workshop next Tuesday, April 24 that will lay it out for you. Author, blogger, and email marketing expert Isa Adney from ConvertKit is joining me to deliver an illuminating presentation that will put you on the path to email marketing success. Sold. Great article, I mean copy.